Explaining about the excitement of kayak fishing would be difficult to the ordinary people, because the excitement, taste and advantages of kayak fishing only will understand those people who sometimes or regularly heading somewhere to fish with the kayak. Maybe you have the experience of recreational kayaking, but enjoy the fishing with it randomly has different taste. You can cover a large area for fishing while you can easily reach to the targeted hotspots. If you have the dream to fish in a blue ocean, the kayak will even ensure the accessibility to many spots in the water or sea. You can catch up some bigger species with enjoying the game fishing. But what you have to do as a beginner to fish with kayak in offshore and inshore?. This post will give you some valuable tips as if you haven’t any harsh experience. 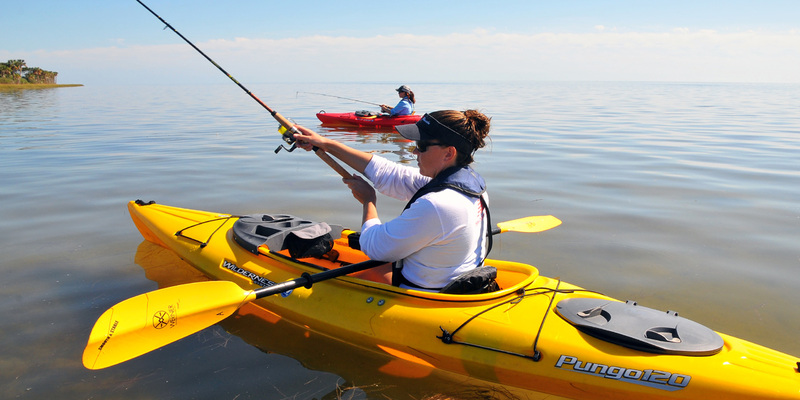 Before jumping into the fishing, at first you should choose a fishing kayak. Because these kinds of kayaks are constructed with a perfect structure for fishing that basically the manufacturer designs to think about the angling in mind. 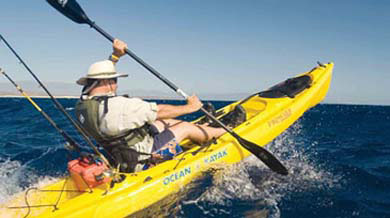 Although in some cases you can use a recreational kayak for angling. But the service of it wouldn’t be as good as the angler kayaks are in it. So to enjoy the extra advantage, you should use a fishing kayak instead of a recreational kayak. If you want to use the kayak for offshore or surf fishing, of course, don’t forget to use a highly stable kayak with great tracking ability. Like other kinds of fishing you must not to forget to wear safety stuffs like the fishing sunglass and fishing gloves and even fishing shoes. If you fish in the ocean, you have to survive in the rough waves with your kayak. So if you don’t wear a kayak fishing life jacket, then you are in the risk. Moreover, if it is possible, you should also include some first aid kits with the gears. If you have recreational kayaking experience, then you may have got enough skill to maneuver a kayak in the lake, slow moving river and pond. But if you want to fish in the surf or ocean, then you should do it in a skilled mind. So before planning for fishing in the rough water or ocean, make sure you have the skill to maneuver your kayak in the ocean. Moreover, don’t stand up over your kayak in very rough water, because in that case you can lose the control. As well, when you don’t paddle the kayak, keep the paddle in paddle holder to save it from losing. You need almost the same fishing gears that you use for other fishing. So when it comes to carry the fishing gears, then you can conveniently use the storage boxes of the kayak. You can safely put all these gears in the storage box, like the reels, lures, tackle box, lines, pliers, scissors, nets and fish finder. You should also carry the fishing cooler that you can put in the open deck storage. Moreover, you can carry some drinks and snacks in your kayak to refresh yourself during fishing. To stay in a place you can use an anchor that will hold the kayak in a fixed place by a rope. There is the foldable anchor for easily carrying out or you can directly carry a sturdy pole that you can stick into the mud. So the moving water won’t push your kayak to the non-desired way. Moreover, if the fish pulls the fishing line aggressively, then you can even manage the catch by staying in your place. You may have used the backtrack gps like for cycling, touring and finding your car in the crowded parking lot. But the backtrack gps also would be a handy device for kayak fishing. 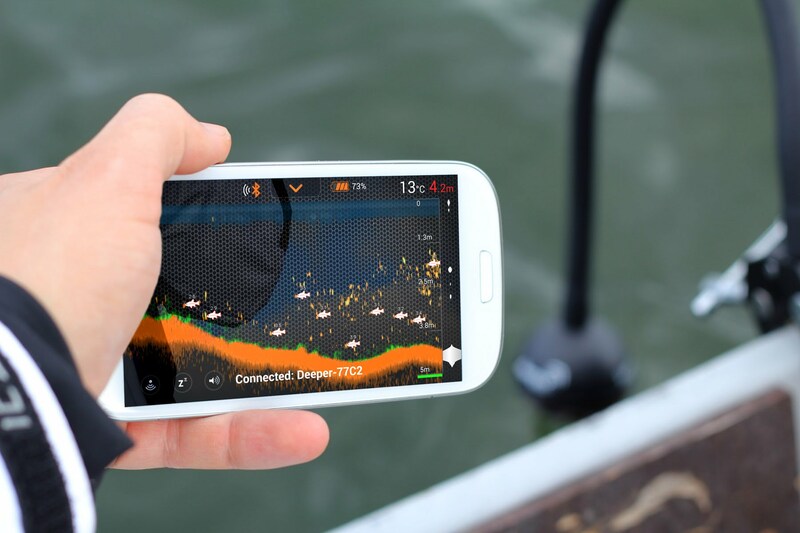 Because if you fish in an unfamiliar river or a big ocean thorough moving randomly, then end of the day the gps will help you to reach on the main point from where you have started. A fish finder is an excellent invention of the era. Instead, finding the hotspots blindly, you should use the fish finders. It’s a time saving and easier process for finding the hotspots. You can increase the catches as you would basically know where the fishes are hidden. With finding the hotspots you can even mark the species, so you can apply the specific baits after marking the species. I would never suggest that you go for surf fishing or ocean fishing in a stormy or very bad weather. Because the brutal waves can tilt down your kayak and the result would be your life in the risk. You have to keep in mind the water will never be your friend. Moreover, the fog and rain would give some disadvantages for kayak fishing. Because you would lose your track while the rain would be very annoying. So you better get a weather update before going for an offshore fishing expedition. Not mandatory, but if you want to fish at night, especially when the moonlight reflects the water (perfect time for night time fishing), you should obviously adjust a fishing headlamp with your head. It ensures that you aren’t going to handle your gears blindly. If you don’t transport your kayak in the right way, then it might be the reason of cracking your kayak. If you want to transport by your car, make sure you are using a kayak roof rack and you have tied the kayak strongly. But if you want to get the kayak on the edge of the water in other way, then you may use a kayak cart. Best Carbon Fiber Kayak Paddles- Lightest Paddles Ever! Fishin Things Copyright © 2019. Disclosure: Fishthings.com uses the advertising system of Amazon Associates and earns some commission when a respective reader purchases something through the affiliate links we provide. Mostly, the products we recommend to purchase may contain the affiliate links, but, you won’t have to pay any extra money or extra cost for the commission we earn. Basically, behind the Fishthings.com there are an expert fishing enthusiast owner and some expert researchers and writers. So, to run this website, we require a decent amount of money and we spend a big portion of the commission to continue our hardwork.